Axdea 3D CAD, BIM based IBS Score - Axdea 3D CAD, Free BIM-based IBS Score Software. Axdea 3D CAD, BIM-based IBS Score Software. Axdea is a FREE 3D CAD, BIM-based IBS Score software and was released by Innovacia Sdn Bhd on 26th March 2018 during the International Construction Week (ICW) at the Kuala Lumpur Convention Centre, Kuala Lumpur, Malaysia. Axdea is customised for IBS Scoring system based on the Malaysian Construction Industry Standard. 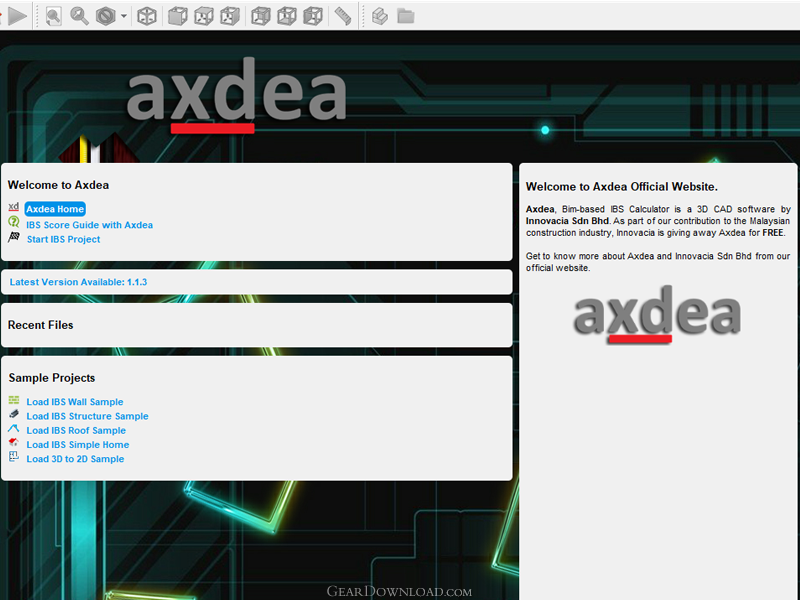 As part of our contribution and support to the Malaysian Construction Industry, Innovacia Sdn Bhd has announced that Axdea software will be distributed for FREE with no limitation. 1) IBS Scoring System: Automatic calculation of IBS score based on the Malaysian Construction Industry Standard. 2) BIM-based: Axdea supports the use of Material and IFC file for Building Information Modeling. 4) Task Oriented Design: Specific tools for specific task such as arhictectural, mechanical, structural, drafting, simulation and many more. The tools are grouped into Workbenches for convenience. 5) Parametric Modelling: Full parametric modelling software based on properties for precision. 6) Macros and Python: Modular architecture to allow plugins to add more functionality using Python scripts or Macros. Record complex actions and replay for future convenience. 8) DWG Support: Import/Export DWG format using Teigha converter. Axdea is highly customised for IBS scoring system. Axdea will be able to automatically calculate the IBS score while you build the models. The IBS score has been categorised into Wall, Structure, Other Simplified Solutions and Total Score. Users can generate the IBS Score report in PDF for print out or submission to other parties. This download (Axdea_x64.exe) was tested thoroughly and was found 100% clean. Click "Report Spyware" link on the top if you found this software contains any form of malware, including but not limited to: spyware, viruses, trojans and backdoors.